An outstanding opportunity at an excellent price, this lushly landscaped tropical farm is ideally suited for the development of eco-tourism and agricultural development projects. 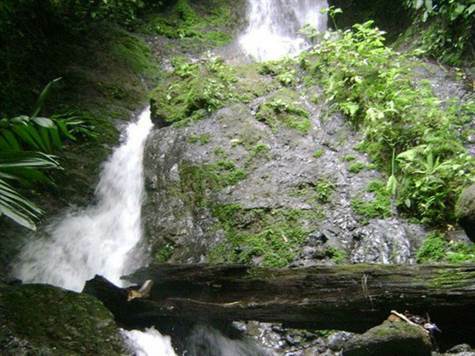 Located just 3 kilometers northeast from downtown Naranjito, Quepos, this property is comprised of a blend of both wilderness and pastures. The property boasts an ample water supply thanks to the presence of the Río Paquita that makes its way through the farm along with as many as seven springs that are present during the rainy season. With a waterfall cascading down the property's mountain, this farm offers unlimited potential, particularly when compared to the neighboring areas. Investors who are seeking the ideal property for ecotourism will find that this property offers everything necessary to develop a first-class resort. Gently rolling hillsides are ideal for walking or horseback riding, while other hilltop areas are suitable for the construction of condos, villas, or houses. Each of these areas offers spectacular forest, mountain, and river views. One of the sections of the property is primarily flat, easily allowing for the construction of a runway for small aircraft. Electricity and phone service are also available. A friendly ex-pat community is already in place, as many of the neighboring farms are owned by North Americans. Conveniently situated near a school, church, market, telephone, and other amenities, this property is only 8 kilometers from La Managua Airport and Quepos Hospital. Downtown Quepos is just a 12-kilometer drive from the property, while Manuel Antonio National Park and Beach is situated 16 kilometers away. Consisting of five sections with a total of more than 790 acres available, this property is exceptionally priced at just $12 million and offers an once-in-a-lifetime investment opportunity.